The quick, physical way to hibernate your MacBook. 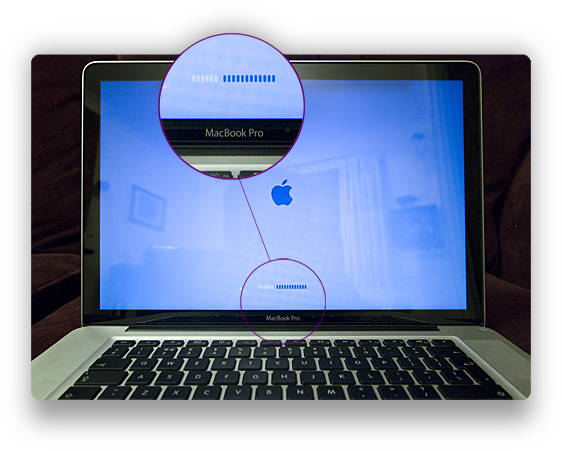 When you close your MacBook’s lid, the machine sleeps. But you’ve probably noticed that it still uses power in its sleep — about 20% of the battery per day, so after about five days it’s flat. 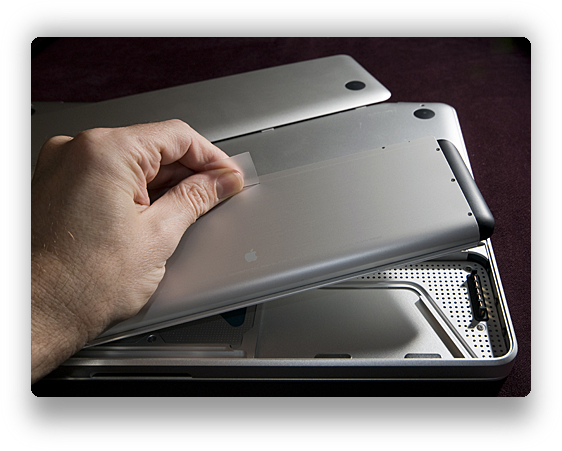 What you may not know is that you can put the MacBook into a much deeper state, where the machine uses almost no power at all. A full battery will then last for months rather than days — useful if you know you’re not going to use your MacBook for a while. Now, you could install freeware to put your MacBook into this deep-sleep state (often call hibernation) and indeed I have, and it’s good: Deep Sleep. But for the hell of it, here’s a physical way of doing the same, with no additional software required. First, close your MacBook’s lid. The illuminated Apple logo on the lid will extinguish almost immediately, but we’re not looking at that. It will eventually start pulsing (breathing 🙂 in its sleep). If that happens almost immediately then sorry, but your MacBook is probably too old for this to work (it hasn’t copied its state to disk), so please don’t carry out the rest of these instructions — you may cause damage. If, on the other hand, it takes tens of seconds before the light goes from solid-on to pulsing (typically twenty seconds or so) then your MacBook is recent enough for this to work, and you’re ready for the next step. If the power light is now happily pulsing and it took a while to get to that state (whilst the MacBook copied its state to disk) then its time to interrupt the power. Then put it all back together and hey-presto, the power light is off and its consuming almost no power at all. 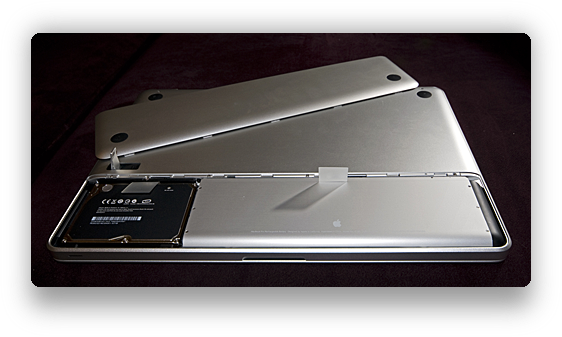 After a short while (about 35 seconds on my late-2008 MacBook Pro with 4GB of RAM), your MacBook will spring back to life in the same state as it was when you closed the lid, and with the same battery life! 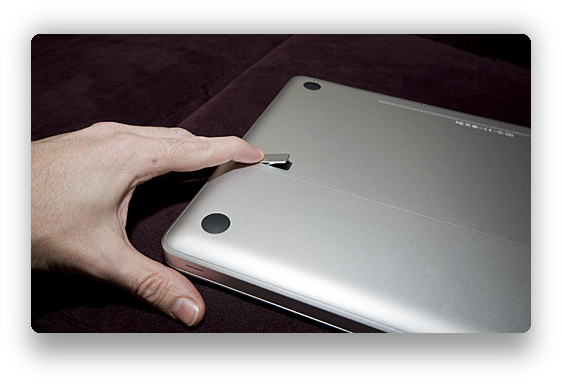 Modern Macs do what Windows Vista (for example) calls a Hybrid Sleep whereby it saves its state to disk as well as maintaining the same state using battery power. When you close the lid, the illuminated Apple logo goes off immediately so that you know it’s going to sleep, but actually the MacBook spends the next 20 seconds or so copying its state (mostly the contents of its RAM) on to disk. This is so that, should the battery go flat (and it will do within days, even if it’s full to start with), you won’t lose any data — you just have to wait longer for the machine to wake up once power is restored. 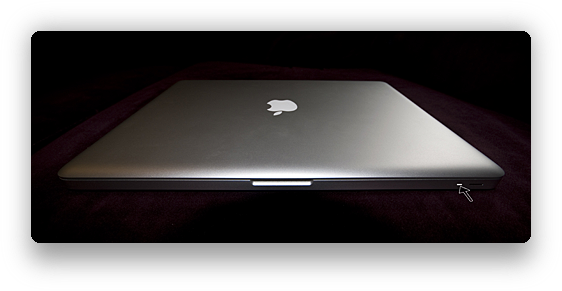 The MacBook then enters a light sleep (usually called standby) whereby the MacBook’s state is preserved by maintaining power to the machine’s RAM, and it’s that power feed that drains the battery. When you pull the power for a moment, the machine no longer has any live state to preserve and so is essentially off and pulling no power. When you eventually switch it on again, Mac OS X restores its state from the hard drive and everything’s back as it was. It just takes a little longer, that’s all. You can’t do this on older MacBooks (the clue is in how long the power light takes to reach the sleeping state (pulsing on and off) — if it’s near instant then hybrid sleep isn’t happening and this isn’t going to work). Don’t plug in fresh USB devices whilst the Mac is asleep and then wake it from hibernation, as you may find your Mac is less than happy about it. If you don’t like the thought of removing your battery then not to worry — there are several software solutions that will also do the job, and there’s a good guide to them over at Geek Guides.